I have been trying to export several different videos over the last week and I simply cannot get it to work. 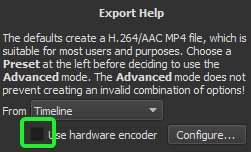 Everytime I export, no matter if it’s as .mp4 or .mov, the project is exported as purely audio with no video despite doing exactly the same as I’ve been doing in the past. I have absolutely no idea what’s going on, please help me Shotcut forums! Did you enter the Export Advanced options? If so, what did you change? Did you choose a preset without entering Advanced? Do you have your video track(s) hidden? Do you have any filters applied to the Master, or Track Header? If you do, one of these icons highlighted in red will appear. If so, which filter? Does your computer meet the minimum specifications to run Shotcut? Thank you very much, I thought I had tried unchecking the Hardware Encoder but that did the trick!